©2014 WordFire, Inc (P)2014 Brilliance Audio, all rights reserved. Not that Kevin Anderson doesn't deserve credit for the excellent material, but Phil Gigante takes it to the next level. It's like he was made to be Dan Shamble and company. This series is one case where I can honestly say I don't think I would enjoy it nearly as much in print. This installment in the series was particularly funny which is good because the humor is one of the things I love most about these books. It follows pretty much the same pattern as the previous books- Dan (with the help of Sheyenne, Robin and McGoo) works on several cases at once with some of them ultimately being interconnected. Lots of fun new clients. An absolutely delightful listen. Well worth the audible credit!! This is a fun book. It goes a little overboard in the description of the results of some misadventures. The character descriptions are good, the introduction of new characters is good. There were a few inconsistencies in the story that caused me to give it 3 stars. They did not detract to the overall story. #1 Detective TO THE DEAD!!!!!! I really enjoyed Slimy Underbelly! The characters, as always, were well developed. Kevin J. Anderson masterfully writes the Dan Shamble series and Phil Gigante brings them to life !!! Would you listen to Slimy Underbelly again? Why? Yes - I like the story and I didn't realize how much Phil doing the reading made the series. PLEASE PLEASE tell me that Kevin Anderson reads or can be given this information. If the guy who read "Working Stiff", I won't be buying any more of this series through Audibles. Bring back Phil. Not as good as previous installments. The story was a bit contrived and unnecessarily complex, making it hard to follow. I would still recommend this book as these characters are great fun. While this isn't the best installment in the series it continues to amuse and entertain and what more can you ask than that. 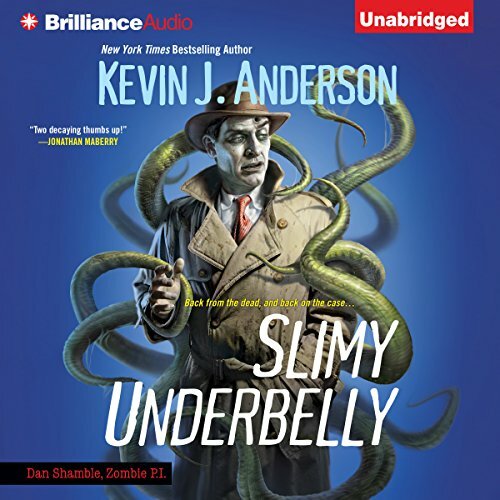 What other book might you compare Slimy Underbelly to and why? I have heard it compared to the Jim Butcher Novels but cannot speak to that myself. In my experience it is somewhat similar to the Xanth novels in its tongue and cheek take on magic. The final scene with Achooloo and his parents is just hilarious...and disturbing...and weird...and great! If you could rename Slimy Underbelly, what would you call it?